Contrary to popular belief, ringworm is actually not a worm at all, but a skin condition caused by a fungal infection. There are several different varieties of fungi associated with ringworm; the incidence of each fungus is dependent upon your geographical location. The occurrence of infection is widespread across the globe and may be transmitted to nearly every species of domestic animals, including canines. It can even be passed on to humans. It is therefore imperative that owners not only be aware of the symptoms, but also know the causes and subsequent treatment options for this unpleasant skin infection found in dogs. Dermatophytosis, more commonly known as ringworm, is indicative of the round, red, and often raised appearance that is also seen human ringworm skin infections. Although it is not a life-threatening disease, it is extremely contagious and requires professional treatment and management as administered by a veterinarian. As pet owners, it’s important to know the signs and symptoms of ringworm in dogs in order to prevent the spread of infection to people or other animals. Ringworm is a superficial skin condition affecting a few specific areas of the body (primarily the head, ears, paws and forelegs), and typically, you will notice inflammation at the site of infection. In canines, the fungus lives and grows in the outermost epidermal layer and in the hair follicles, and sometimes the nail beds. Tell-tale signs of ringworm in dogs include circular areas of hair loss across your dog’s body, including lesions that may start to heal in the middle as they increase in diameter. This usually results in a patchy appearance of the coat, accompanied by redness, scaling, nodular lesions and scabbing of the skin. Dogs who suffer from this condition most frequently include puppies (due to an immature immune system and a consequent inability to fight off mites), older dogs, and dogs with compromised immune systems or preexisting health conditions. On occasion, there are inapparent carriers, i.e., dogs who carry the disease-causing fungus but are asymptomatic. Despite showing any signs or symptoms, they are still contagious and therefore capable of spreading ringworm to both humans and other animals. If you notice any of these symptoms in your dog or other pets in your home, be sure to contact your veterinarian immediately to start a course of treatment and prevent further infection to other inhabitants in your household. Certain symptoms – such as changes in the appearance of your dog’s coat, skin inflammation or crusting, and hair loss – could be indicative of other health problems. 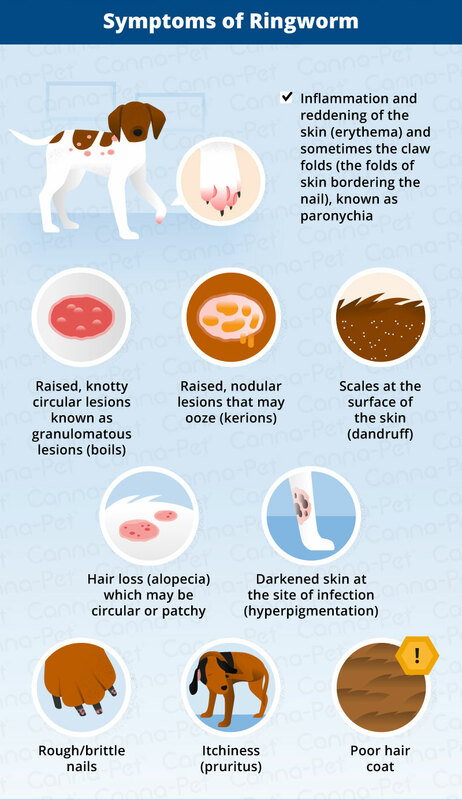 Skin conditions may be linked to a variety of underlying issues in your dog, such as hypothyroidism, Cushing’s Disease, allergies, a nutrient imbalance, the presence of different parasite, or even another type of infection altogether. Only your vet can ascertain the root cause of the problem and prescribe an appropriate course of treatment. How Do Dogs Contract Ringworm Infections? Due to its highly contagious nature, ringworm is spread via direct contact with the fungus. 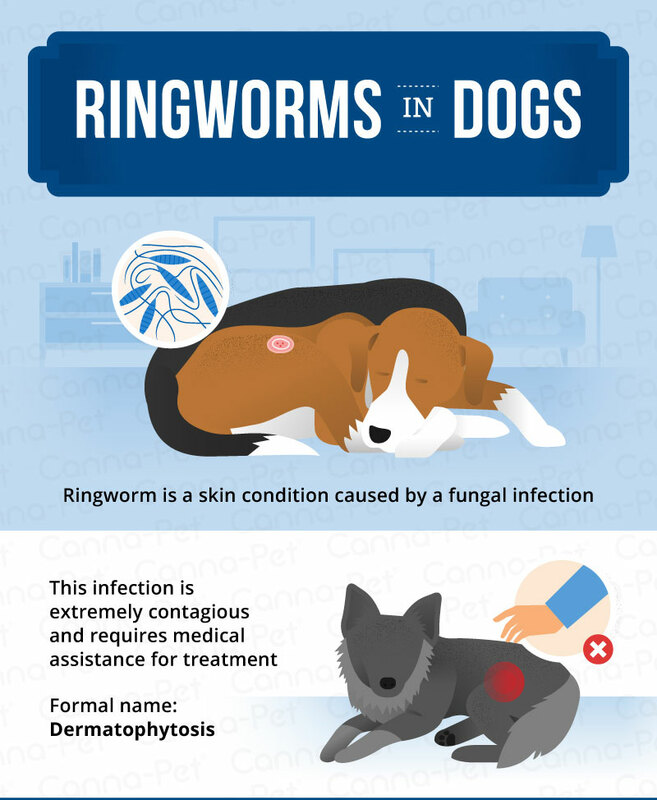 Ring worm is transmitted when your dog comes in contact with any environment where hair or scales collects, whether that’s an infected person or another animal, but also objects, such as a food bowl, a sofa, a brush, carpeting, or bedding. Because the fungal spores responsible for the skin infection can live up to 18 months, it is very easy to contract, as it spreads through shedding. Since hair follicles are weakened by ringworm, your dog’s hair becomes brittle and breaks off easily, spreading the disease throughout your home. In addition, your dog may be more susceptible to fungal infections if he has a disease, underlying health condition or is on a medication that decreases his ability to develop a normal immune response. It should also be noted that areas of dense animal populations (such as a kennel or animal shelter) as well as environments where there is poor nutrition or unsanitary conditions increase the risk of infection to dogs living in such surroundings. Is It Possible For Other Animals To Get Ringworm? Ringworm doesn’t discriminate among the animal kingdom – the same fungi that is responsible for the majority of ringworm cases in dogs also affects cats, too. Because many pet owners have both dogs and cats under one roof, chances are cross-contamination is highly likely. In addition, many species of domestic animals can contract ringworm (including livestock), so be sure to speak with your vet to address the risks of spreading ringworm between your pets and other animals, as well as learn how to treat and prevent future outbreaks. 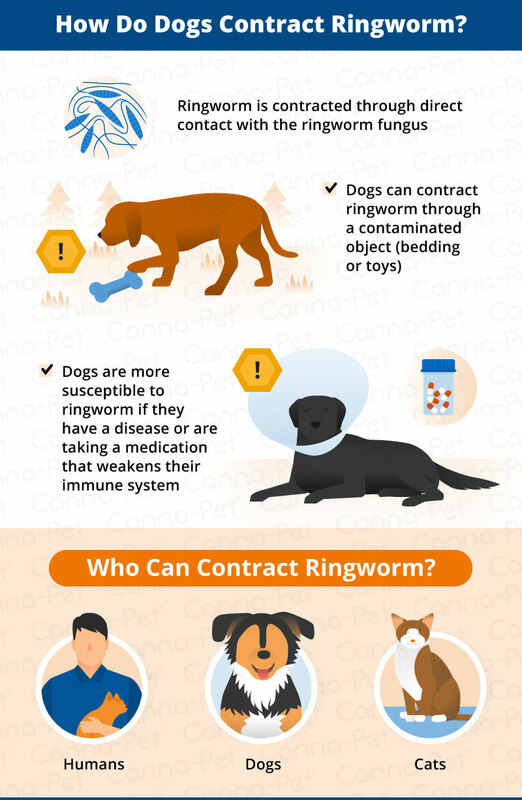 Can Humans Contract Ringworm From Their Pets? There are many forms of ringworm among humans – this pesky skin condition has many variants, including Tinea pedis (athlete’s foot), Tinea corporis (fungal infection of the arms, legs and trunk) and even Tinea faciei (fungal infestation of facial hair). Keeping this in mind, it’s essential to take this parasitic skin infection seriously and learn preventative measures to protect you and your loved ones. 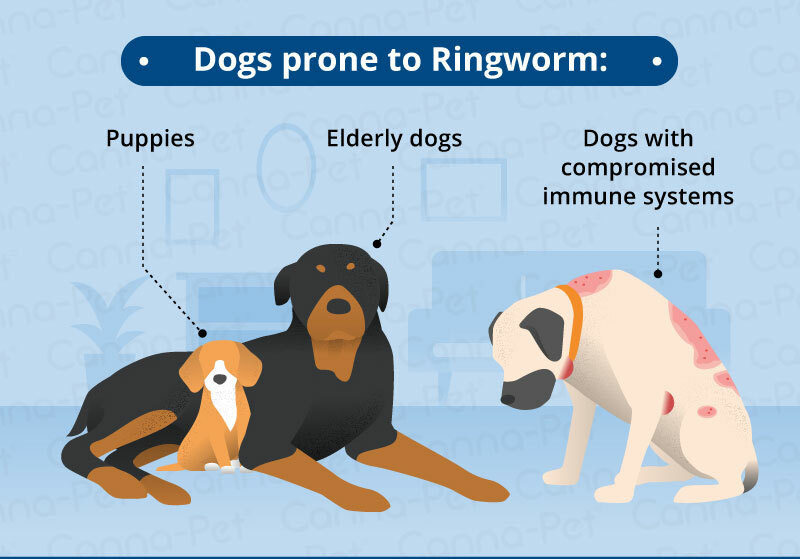 Individuals with compromised immune systems, the geriatric population, and children are at the highest risk of contracting ringworm from dogs and other pets, so treating it when you first recognize the symptoms is a surefire way to prevent cross-contamination in your home. If you believe your dog or other pet may have ringworm, contact your vet immediately. In humans, tell-tale symptoms are similar to our furry friend’s – a roughly circular rash that is often raised, red, and itchy. If you or another person in your household notices a rash anywhere on the body after a pet has been diagnosed with ringworm, be sure to contact your primary care physician for a check-up and treatment, as it won’t go away on its own. Once you’ve made an appointment with the veterinarian, he or she will run a series of tests along with a physical exam to ascertain your dog’s condition, as well as samplings of skin cells or hair for a fungal culture. If your dog has been diagnosed with ringworm, your vet will go over treatment plans for your pet. This course of treatment will take different things into account, including how severe the case of ringworm is, the number of pets in your home, and whether or not there are children, elderly adults, or individuals with compromised immune systems living in your household. There are a variety of topical treatments available to treat your dog’s ringworm, including medicated shampoos, creams, and ointments to help treat and stave off the infection. Your vet may also recommend trimming your dog’s hair to expedite healing, including shaving affected areas so that the medicine can absorb directly into the skin. Although topical therapies can take months to completely eradicate the infection, it does help to prevent further cross-contamination and reoccurrence of ringworm in your household. Typically used in tandem with topical treatments, anti-fungal oral medications can assist in fighting the infection. They also take at least several weeks to see visible results; however, they can take several months to completely eliminate the infection. During the course of your visit, your vet will most likely ask if you have any other animals in your home and recommend testing them for ringworm, even if they don’t show any signs or symptoms. One of the most important facets of treatment is to be sure to finish medications and follow instructions implicitly – just because the symptoms go away, it doesn’t necessarily mean that the ringworm has fully cleared up or that your furry friend is no longer contagious. Your vet will likely re-test your dog to ensure he has a clean bill of health. Because ringworm is highly communicable – infected hair follicles and hair that has shed from your dog contain spores that remain contagious for months at a time – it’s important to decontaminate your household as thoroughly as possible to eradicate any traces of ringworm. Although this may pose a daunting task, disinfecting and deep-cleaning items such as grooming tools, upholstered furniture, clothing, and bedding is essential to the health and well-being of everyone in your home. Many owners find it convenient to quarantine dogs and other pets affected by ringworm – if you have a room that is easy to clean (i.e., a basement, garage, or other room with little furniture and/or upholstery), it makes it much more convenient to maintain during therapy. If you’re unable to keep your dog in a room with hard floors (or are limited in space), be sure to vacuum often and remove stray hairs from furnishings and other upholstered surfaces, as well as disinfecting and washing items frequently to help prevent additional contamination and re-infection. Even though pet owners aren’t faced with ringworm infestations on a daily basis, it’s still wise to practice good environmental hygiene and safeguard your home in the event that your dog is infected. One of the most effective ways to prevent reinfection and cross-contamination between family members, your dog(s) and other pets is to thoroughly clean and disinfect your home, car, and any other areas he’s spent time in during treatment, and once again after your dog has been given a clean bill of health. According to the ASPCA, one of the best (and cheapest) disinfectants you can use around the home is bleach – dilute one part to 10 parts water and use on affected areas whenever suitable. Another tip: frequent vacuuming is recommended, but be sure to change the bag (or disinfect the machine if it’s a bagless model). Keep antibacterial soap handy so you can wash up after bathing or touching your dog, as well as cleaning his belongings. Although it’s nearly impossible to prevent your dog from contracting ringworm from an unknown source, you can help to prevent cross-contamination from occurring in your home by quarantining your dog (if possible) during his course of therapy. Since infected hair can spread the disease during shedding (and continue to carry the disease even moths after it’s fallen off of your pet), it’s important to administer a deep clean to your entire home, including any bedding, toys, bowls, or other items your pooch may have come in contact with during his illness. In addition, be sure to follow your vet’s instruction with regard to any cleaning routines, including recommended disinfecting sprays or other tools of the trade. You may wish to discard the infected pet’s bedding, chew toys, and other related items to ensure your dog doesn’t get re-infected. Additionally, if your dog has access to rodents (or if rodents are in your immediate environment), be sure to address the issue to eliminate any pests, which may require the assistance of a professional exterminator. Fortunately, ringworm infections aren’t a life-threatening illness, and although they may be unsightly, they pose no long-term risk to your pets or family if caught early on. The biggest risk lies in re-infection – if not treated properly under the supervision of a vet, the cycle can perpetuate itself. Be sure to follow all instructions from your vet and finish any medications or treatments as prescribed, as infected animals remain contagious for several weeks, even during therapy. As mentioned, cleaning your home during and after a ringworm episode can also assist in the prevention of future outbreaks. If you adhere to these guidelines, your furry friend will be ringworm-free and back to his old self before you know it. “Worms in Dogs.” WebMD, Accessed 8 Aug. 2017. www.pets.webmd.com/dogs/worms-in-dogs. “Ringworm – Signs, Diagnosis and Treatment.” Vetwest Animal Hospitals, 6 Apr. 2016, Accessed 8 Aug. 2017. www.vetwest.com.au/pet-library/ringworm-signs-diagnosis-and-treatment. Burke, Anna. “Ringworm in Dogs – Symptoms, Treatment, and Prevention.” American Kennel Club, 9 Nov. 2016, Accessed 8 Aug. 2017. www.akc.org/expert-advice/health/ringworm-in-dogs/. Clark, Mike. “Ringworm In Dogs: Symptoms, Causes, And Treatment.” Dogtime, 28 July 2017, Accessed 8 Aug. 2017. www.dogtime.com/dog-health/53949-ringworm-dogs-symptoms-causes-treatment. 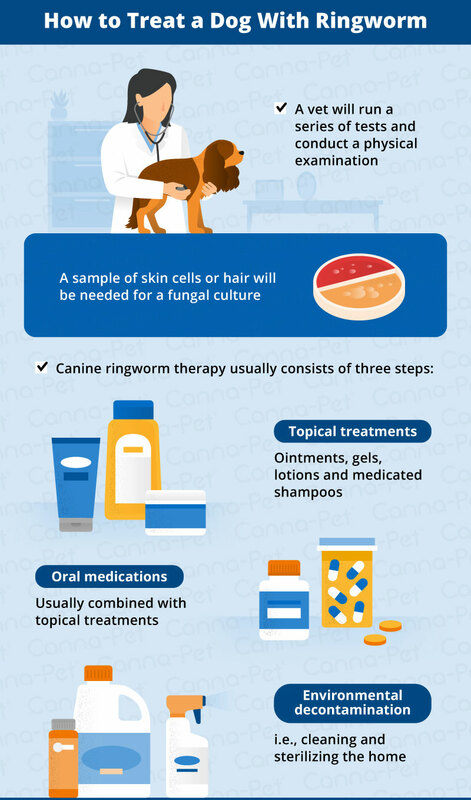 “Ringworm in Dogs – Symptoms, Causes, Diagnosis, Treatment, Recovery, Management, Cost.” WagWalking, Accessed 8 Aug. 2017. www.wagwalking.com/condition/ringworm.